TUESDAY, Sept. 20, 2016 (HealthDay News) -- Stress could undo some of your healthy food choices, a new study suggests. Stressful events from the day before appear to eradicate any health benefits a person might have gained from choosing a breakfast rich in "good" monounsaturated fats, as opposed to a breakfast loaded with "bad" saturated fats, Ohio State University researchers found. "They physiologically looked like they'd eaten the high saturated fat meal," lead researcher Janice Kiecolt-Glaser said of stressed-out healthy eaters in the study. "Their advantage in eating the healthier meal disappeared." Previous research has shown that saturated fats increase inflammation in the body, which has been linked with heart disease, arthritis, type 2 diabetes, osteoporosis and a host of other health problems, said Kiecolt-Glaser. She's director of the Institute for Behavioral Medicine at Ohio State's Wexner Medical Center. "Inflammation is now looking like it's associated with a lot of the nasty diseases of aging," she said. "It's like a catalog of what you don't want in your life." Saturated fats mainly come from animal sources, including meat and dairy products. They tend to be solid at room temperature; for example, the white fat found on a steak or pork chop is saturated fat, according to the American Heart Association (AHA). On the other hand, diets rich in unsaturated fats -- such as the Mediterranean diet -- have been shown to help heart health. Unsaturated fats generally come from plants, and are liquid at room temperature, the AHA says. It seems straightforward, but stress complicates the way the body processes food, Kiecolt-Glaser said. Other studies have shown that a person's metabolic rate is lower and insulin levels are higher following a stressful day. To see how stress might affect dietary fat, Kiecolt-Glaser and her colleagues recruited 58 healthy women to eat two separate but nearly identical breakfasts on two different days in their clinic. Their average age was 53 years. Both breakfasts consisted of biscuits and gravy, and each contained 930 calories and 60 grams of fat, almost identical to the composition of a Big Mac and medium fries or a Burger King Double Whopper with cheese, the study authors said. "They were modeled after fast-food meals," Kiecolt-Glaser said. There was one important difference. One breakfast was made mostly with saturated fat, while the other primarily contained a monounsaturated sunflower oil, the study said. The women also completed a standardized interview about events that had stressed them out the previous day. "It's an interview that separates out minor frustrations from events that are more meaningful and more likely to produce physiological changes related to stress," Kiecolt-Glaser said. Women free from stress tended to have better blood test results after they ate the monounsaturated fat biscuits and gravy, compared with when they ate the saturated fat-laden alternative, the research showed. These women had lower levels of inflammatory markers, and they also tested lower for cell adhesion molecules -- a substance that increases the likelihood of plaques forming on blood vessel walls, causing hardening of the arteries, the study reported. But when women in the study had a stressful event before the breakfast test, the hardships of the previous day appeared to erase any benefits linked to the healthy fat choice. "If they were stressed, it wiped out all the good stuff," Kiecolt-Glaser said. Even though the study focused on women, Kiecolt-Glaser said there's no reason to think men would react differently to stress. 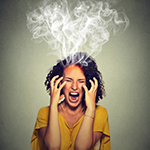 These findings jibe with others regarding the link between stress and diet, said Penny Kris-Etherton, a distinguished professor of nutrition at Penn State College of Health and Human Development. "There is a growing literature that stress blunts good diet responses," Kris-Etherton said. It could be that a bad reaction to stress overwhelms the potential benefits of a healthy meal, or it could be that the stress itself alters the body's processing of the meal, she said. Interestingly, Kiecolt-Glaser and her colleagues found that stress did not make the body's response to a high-saturated fat breakfast even worse, as they had anticipated. "We expected we might see even greater adverse responses to the saturated fat meal, but we may have already maxed out," she said. "It may be when you overload the system that much, you may have a hard time seeing the real effects of stress." In short, people who follow a heart-healthy diet also need to manage their stress, Kiecolt-Glaser and Kris-Etherton said. That could mean sharing your problems with a friend or family member, exercising regularly, getting lots of good sleep, trying meditation or yoga, or simply doing something pleasurable like taking a warm bath or lighting a scented candle, they suggested. This doesn't mean that you get a free pass to eat an unhealthy meal following a rotten day, however, another expert noted. "As a registered dietitian, this study would not change my recommendations in regards to a healthy diet or one rich in monounsaturated fat compared to saturated fats," said Jennifer Kartashevsky. She is a certified diabetes educator with the Diabetes Alliance Program at the Mount Sinai Health System in New York City. "We do know that both stress and diet can have an effect on inflammation in our bodies," Kartashevsky continued. "The take away is to continuing to follow a diet rich in non-starchy vegetables, lean proteins, fresh fruits, whole grains and monounsaturated [fats] to give yourself a better base if stress does come your way." The research was published Sept. 20 in the journal Molecular Psychiatry.